MSPE stands for Medical School Performance Evaluation. It is a document that describes your performance in the medical school. Since the transcript will have the subjects, hours per subject and may also include the passing grade for the subjects, in many cases the MSPE ( also called as Dean's letter) will include a brief description of your character, personality and if you had any problems in medical school. Many medical schools have a preformatted template that they use in lieu of MSPE but there are some international medical graduates do not get such a letter. Following is sample MSPE or the Deans letter, you can copy to suit your needs and use it to get signature from the office of your medical school. For those who will receive a Deans letter from their school, this is an example of how it may look. The wordings of the template are provided below if you wish to copy it. This is to certify that Dr. ___________________________________ was a bonafide student of this college from __________________ to _______________ while pursuing M.B.B.S course. 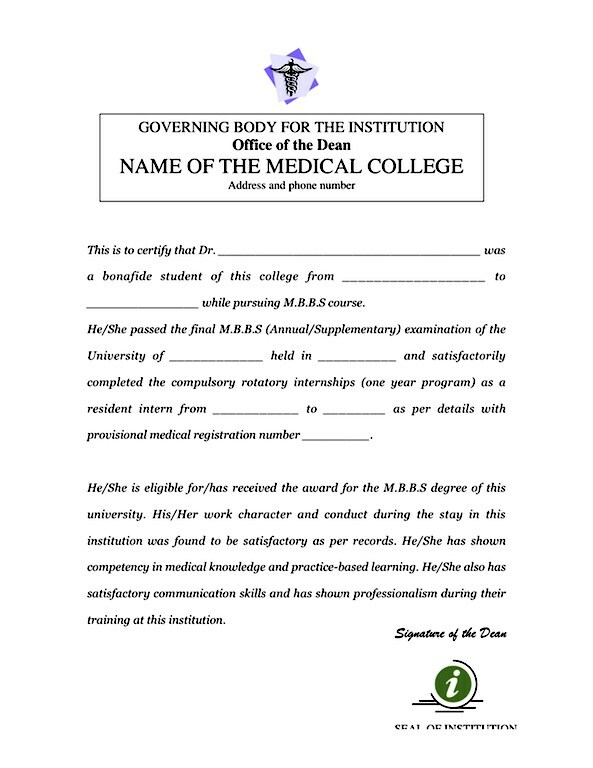 He/She passed the final M.B.B.S (Annual/Supplementary) examination of the University of ____________ held in __________ and satisfactorily completed the compulsory rotatory internships (one year program) as a resident intern from ___________ to ________ as per details with provisional medical registration number _________. He/She is eligible for/has received the award for the M.B.B.S degree of this university. His/Her work character and conduct during the stay in this institution was found to be satisfactory as per records. He/She has shown competency in medical knowledge and practice-based learning. He/She also has satisfactory communication skills and has shown professionalism during their training at this institution. *** Is MSPE same as Deans letter? By the way MSPE has replaced the term “Dean’s letter,” by ERAS to better describe the purpose of this document, which is to be an attestation of performance of the medical student. It is not a letter of recommendation. ERAS Support Services will accept a “Dean’s letter,” but they encourage to submit an MSPE in the format provided. However, many medical schools have their own template which is perfectly acceptable. (which is not a big deal if you have either you are fine). *** How important is it? Unless there is some glaring issue that stands out in your medical education - PDs may not even bother to look. *** What if you dont have the letter? If you cannot get an MSPE or Deans letter - even that is not an issue because in that case ERAS will place a neutral placeholder letter: stating “This document is provided in lieu of the applicant’s MSPE. Please contact the applicant with any questions you may have.” This will ensure that your application will appear as complete.